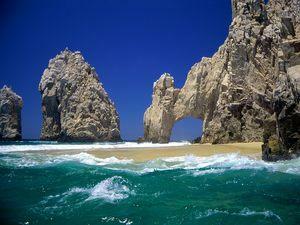 Los Cabos, Mexico is a popular destination for a variety of reasons. 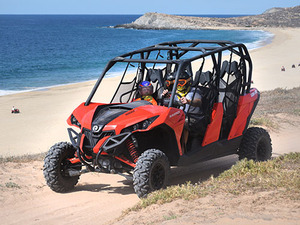 Known as Mexico's Gold Coast, the landscapes are lush, the location to California is convenient, celebrity spotting is common, and there are a ton of fun things to do such as our Cabo San Lucas A-Maze in Cabo Race Excursion or our Cabo San Lucas Desert and Beach Off-Road Adventure Excursion. Put all this together with our wide variety of excursions and you have the perfect mix for a perfect day on one of our Los Cabos Excursions. Viva Mexico! Round trip transportation from outside your cruise tender pier in Cabo San Lucas! Glass Bottom Boat Excursion of Land's End! Lunch with non-alcoholic drink at a local restaurant in San Jose! 4 drinks per person (beer, water, sodas) aboard vehicle! Guided sightseeing of Cabo San Lucas and San Jose del Cabo! See the best highlights of Los Cabos by land and sea! Enjoy the Arch, Land's End, Cabo San Lucas, San Jose del Cabo and a tasty lunch. English speaking certified snorkeling guide and boat crew! Snorkel at Chileno Bay on the Sea of Cortez! All inclusive with buffet and open bar! See Land's End with the Arch, Sea Lion Colony and Lover's Beach! The most fun under the Cabo sun! 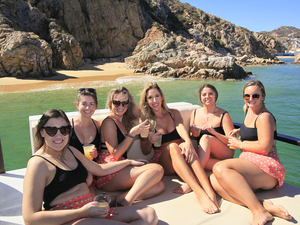 This Cabo San Lucas Party Boat excursion offers great snorkeling at Chileno, lunch buffet, open bar, terrific staff, music, fiesta, and more. Well maintained and powerful Yamaha Wave runners! English speaking certified jet ski guides! Relax on Medano beach afterwards! Explore Cabo Bay, no course to follow! 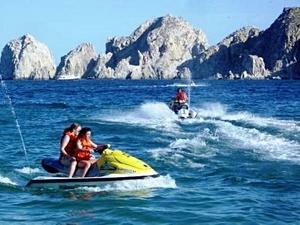 High speed fun cruising through Cabo San Lucas Bay and Sea of Cortez on high powered 1100cc jet ski! Go with the best! Convenient meeting location close to your Cabo San Lucas tender terminal! Bilingual English/Spanish speaking certified parasailing staff! 10 passenger, round trip parasail boat ride! Single and tandem parasail rides available! Gentle, dry takeoffs and landings - dips into the water only upon request! Complimentary soft drinks and bottled water on board the boat! Enjoy a great parasailing flight up to 600ft above the water! Safe and professional staff. Marvelous view of Cabo San Lucas Bay! Fly single or tandem. Round trip sailing adventure on catamaran! Meeting point just steps from your Cabo cruise tender pier! All inclusive lunch and open bar! 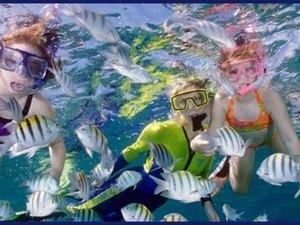 Great snorkeling at Chileno or Santa Maria Bay in the Sea of Cortez! See Land's End, Sea Lion Colony, Lovers Beach and more! Join us for some great snorkeling in the Sea of Cortez! Big stable catamaran, great staff, all inclusive lunch and open bar, party and music. Round trip transportation from your Cabo San Lucas / Los Cabos cruise tender pier! Automatic transmission XT Outlander ATV! Lockers and complimentary cold bottled water! Souvenir photos and alcoholic drinks are available for purchase at the end of the excursion! 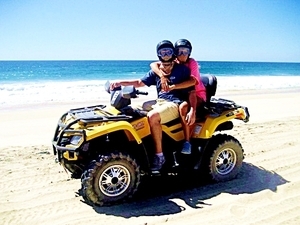 Come with us and explore the best of Cabo’s beautiful landscape on your own ATV. 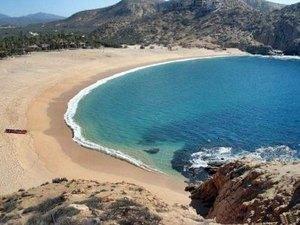 Ride across sand dunes, through parts of the Baja Desert, and across the beaches of Margarita. 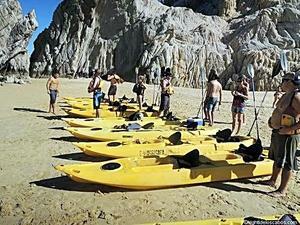 A great Cabo San Lucas shore excursion choice for adventure families! Just a few minutes walk from Cabo San Lucas cruise tender pier! Private luxury custom boat (2 hull style) charter for your group! Sightseeing past Lover's Beach, Divorce Beach, the Arch, Sea Lion colony, and more of Land's End! Snorkel gear and SUP's boards! Complimentary soft drinks, bottled water, and ice! Bring your own food and drinks or optional lunch and domestic bar! Your private little floating island of fun! Great day for everyone w/ snorkeling, SUP's, optional open bar, relaxing and more. Small groups only, personalized service! Views of Land's End with the Arch, Sea Lion Colony, Pelican Rock, Divorce Beach and Lover's Beach! 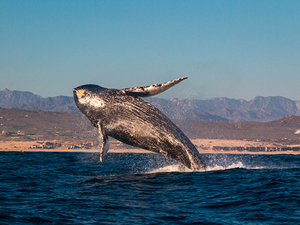 Wildlife spotting guaranteed on this Cabo San Lucas Cruise Excursion! Enjoy a unique experience on this 2-hour excursion in Cabo San Lucas. On board an amazing speedboat, you'll be taken the Sea of Cortez to search and admire one of the biggest mammals at the sea, the migrating whales. Have your camera ready and have fun! Roundtrip private transportation from your Cabo San Lucas / Los Cabos cruise tender pier! 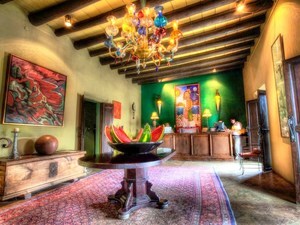 Guided walk through Todos Santos! Onboard complimentary bottled water and beer! 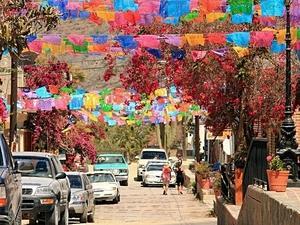 Escape from the crowded Cabo San Lucas and discover the charming town of Todos Santos on this private excursion. Walk through the cozy streets and admire the galleries and art studios. You will also have lunch in the famous Hotel California. The views along the way are beautiful as well! 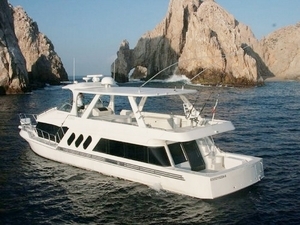 Exclusive private fishing charter cruise excursion in Cabo San Lucas! All fishing gear - rods, reels and lures! The best deep sea fishing fleet in Cabo! Try your luck catching marlin, mahi-mahi, wahoo, tuna and more! 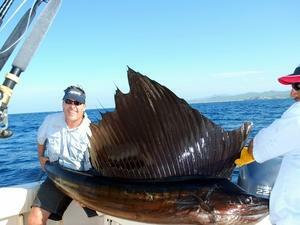 Try deep sea fishing in Cabo San Lucas - great for Marlin, Mahi Mahi Dorado, Sailfish, Wahoo, Tuna and more. This excursion offers the best fleet and crew. Private luxury yacht charter for your group! Choose what activity you want to do and how many in your party! Paddleboarding, snorkeling, whale watching, sunset, fishing options available! Mexican buffet or Ceviche Bar and National Open domestic bar! Pick the private yacht charter package in Cabo San Lucas that fits your group the best! Enjoy this 72' Bluewater custom yacht...fishing, snorkeling, sunset, special occasions, whale watching and more! Round trip transportation from near your Cabo San Lucas / Los Cabos cruise tender pier! Guided horseback ride (approx. 1 hour)! We’ve combined two popular Cabo San Lucas Excursions into one great adventure combo! 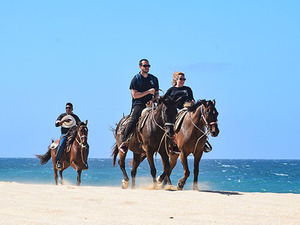 For thrills you will drive your own ATV across the Baja California Desert, then ride on a gentle horse across Migrino Beach! Automatic transmission 4X4 Commander UTV (1 - 2 passengers) or 4x4 Maverick UTV (3 - 4 passengers)! Guided horseback ride (1 hour)! If you love nature, then you'll love this off-the-beaten-path shore excursion. Spend time driving your own UTV through the beautiful Baja California Desert with impressive mountains as a backdrop. Then ride a gentle horse on the lovely Migrino Beach! Bottled water, soft drinks and chips included! Views of Land's End with Arch, Sea Lion Colony and Lover's Beach! With this Cabo San Lucas excursion, you will have the chance to see some of the largest mammals on the earth...the migrating whales off the coast of Cabo San Lucas. Enjoy a photo op at Land's End-see the Arch, Sea Lion colony and Lovers Beach too! English speaking certified off-road vehicle guide! Automatic transmission 4X4 Commander Recreational UTV! 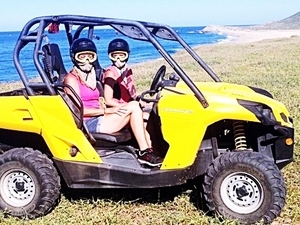 Join us on our exclusive off-road excursion trails through the best of the Cabo San Lucas natural surroundings. Explore the world famous Baja desert, enjoy Margaritas Beach, and all while driving your own 4X4 Off-Road Commander UTV. Great fun for the entire family! Round Trip transportation from your Cabo San Lucas / Los Cabos cruise ship tender pier! English speaking certified Dune Buggy guides! All terrain automatic 400cc sand rail buggies vehicle! 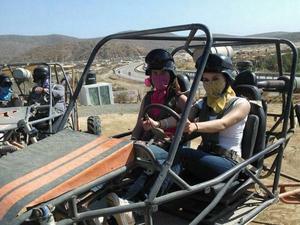 Enjoy an exciting ride through the desert hills, canyon and a pristine beach of Cabo San Lucas. Be amazed with breathtaking views and enjoy the adrenaline of the fun ride. This Dune Buggy Excursion is a blast for all! English speaking certified crew and host! Breakfast buffet and open bar included! See Land's End - Arch, Sea Lion Colony and Lover's Beach! See the migrating whales with an experienced, professional shore excursion staff! 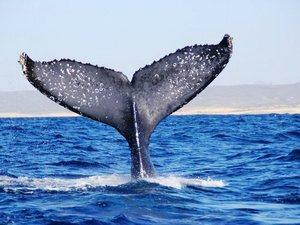 Book early due to high demand for whale watching cruise excursions in Cabo San Lucas! This is a seasonal excursion running December 15th thru April 15 annually! 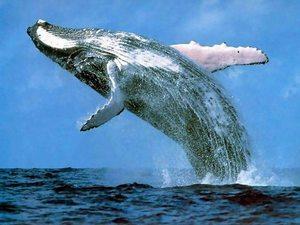 The best value for whale watching - great 2 level catamaran, breakfast buffet, open bar, see Land's End, Arch and much more. Round trip boat ride to watch for whales! English speaking certified boat crew and narrator! Lunch buffet and open bar included! Due to popular demand, early reservations are strongly suggested! Convenient meeting location just steps from cruise terminal in Cabo San Lucas!. Seasonal excursion running December 15th thru April 15 annually! A relaxed whale watching excursion from a large, stable boat. Lots of room, delicious brunch buffet, open bar, and whales! 30-minute insured Fly Bike experience! English speaking certified Fly Bike guide! All necessary Fly Bike equipment! Fly Bike orientation briefing about equipment, safety procedures and basic moves! Learn basic flight skills, like forward fights, turns and landing! 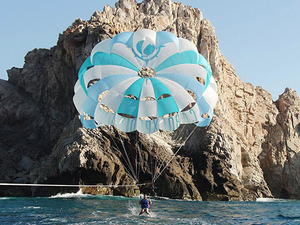 Come and enjoy an amazing adventure in Cabo San Lucas. 30 minutes of water, sun, and, fun on this jet powered bike. This excursion is for everyone, just try! Private fishing charter at a value price! All fishing gear - rods, lures and reels! Best fishing fleet in Cabo San Lucas! Go after marlin, wahoo, dorado, tuna and more! 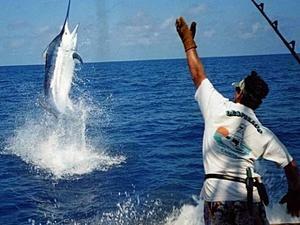 Try your luck deep sea sport fishing in Cabo San Lucas, the Marlin Capital of the World! The best fleet in town and super price! Round trip transportation from right outside the cruise pier! Bottled water and granola bar included! Snorkel both Chileno and Santa Maria Bay! 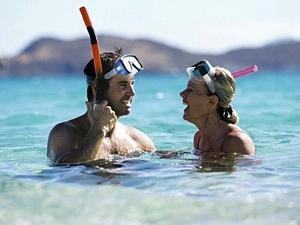 Snorkel the Sea of Cortez at two great sites-enjoy both Chileno and Santa Maria Bay. See the best of both on a guided snorkel. Convenient location from the cruise ship pier in Cabo San Lucas! 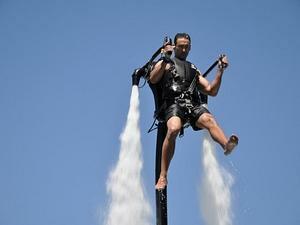 English speaking certified JetPack instructor! All necessary JetPack equipment and orientation briefing included! The newest, more exciting water sport! Easy, safe and fun for most ages! Hoover, fly and skim over the water! Hold on and blast off with the incredible, once in a lifetime adventure! Safe, easy and super exciting fun for everyone. Round trip transportation from outside your Cabo tender pier! Guided stand-up paddle board and snorkel excursion! English speaking certified SUP and snorkel guides! Complimentary bottled water and a snack! 2 fun water sports in the same excursion! 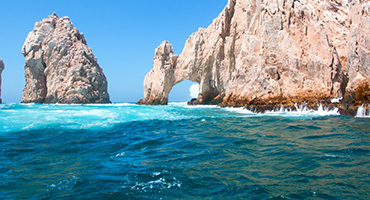 Slow paced sightseeing of Cabo Bay, Land's End, the Arch, Sea Lion Colony and more! Enjoy a guided Stand Up Paddle and snorkeling to Land's End. Easy to learn and great fun for everyone. Open bar and dinner buffet included! 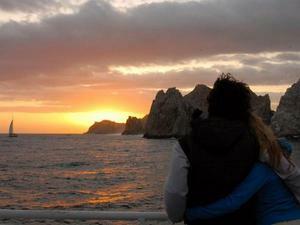 See famous Land's End and Cabo sunset! Cruise the bay and see Medano Beach! Two of Cabo San Lucas' most famous things...a sunset cruise and the Arch! Enjoy a delicious dinner buffet, open bar and spectacular views. 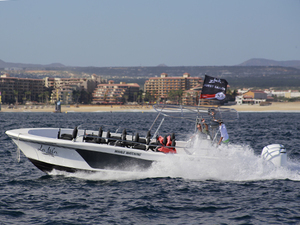 Round trip transportation from your Cabo tender pier! Hike and enjoy the Baja Californian desert on this cruise excursion in Cabo San Lucas! Original Mexico style lunch at the end of the excursion! 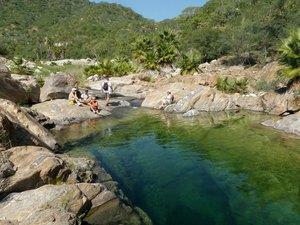 See another side to Baja...hike and swim at Fox Canyon. Enjoy a traditional Baja lunch on this hiking cruise excursion in Cabo San Lucas! Breakfast buffet boat cruise to Santa Marina Bay / Sea of Cortez! Open bar included: mimosas, coffee, juice, and others! Marine life sightseeing and snorkeling included! Light music and fun games! See Land's End, Arch, and Sea Lion Colony! 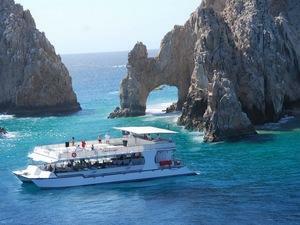 One of the best snorkeling cruise excursion in Cabo San Lucas, Mexico! 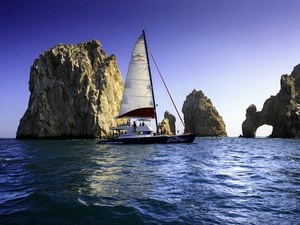 Want a quieter Cabo San Lucas cruise excursion for your group or family? Great snorkeling and service? This is it plus a delicious breakfast buffet! Round trip transportation from your tender cruise ship pier in Cabo San Lucas! English speaking certified kayak and snorkeling guides! Enjoy guided kayak and snorkel excursion! See both Chileno and Santa Maria Bay! Chileno and Santa Maria Bays are the best in Cabo! Enjoy a guided snorkel and kayaking adventure to both of them. English speaking certified surfing and boogie board instructors! Learn to surf or boogie board from the Pro's! 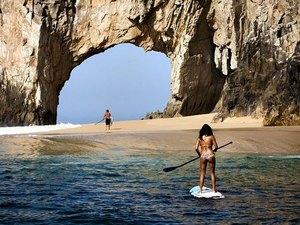 Hit the waves in Cabo and learn from a pro-try your hand at Surfing or Boogie Boarding. Your Cabo San Lucas excursion also includes lunch and beverages. Round trip transportation from just outside your cruise terminal in Cabo San Lucas! All necessary zipline instructions and gear needed! Safe, fun and adventurous for all! Great views and sightseeing along the way! 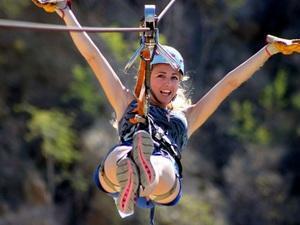 Enjoy some fast, high flying fun with this Cabo San Lucas Canopy Excursion! Zip lining adventure over a beautiful desert canyon. Gorgeous views over the canopy of Cabo. Round trip transportation from your cruise ship terminal in Cabo San Lucas! Complimentary bottled water and snack! All park entrance fees included! Option to have guide drive the Jeep or do it yourself! Enjoy this Cabo San Lucas Jeep excursion to Todos Santos. Browse art galleries, shops, enjoy lunch and much more! Convenient meeting location from your Cabo San Lucas cruise tender pier! All necessary kayaking gear included! Great combo excursion of kayak and snorkel! A guided snorkel and kayak excursion to Land's End! Slower paced and loads of fun. Great for everyone. Convenient shore excursion meeting location just steps from your Cabo San Lucas cruise ship terminal! Boat tour of Land's End with the Arch, Sea Lion Colony and more! English speaking certified boat staff and snorkeling guides! Snorkel at Chileno Bay in the Sea of Cortez! All inclusive open bar and lunch buffet! Get it all in one excursion with snorkeling at Sea of Cortez in Chileno Bay, sightseeing at Land's End, open bar and snack buffet!